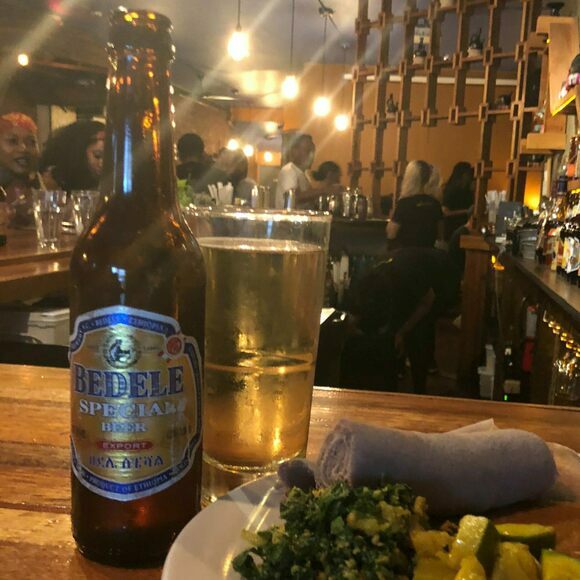 Walk into any dive bar in the Ethiopian capital, Addis Ababa, and there’s a high likelihood you’ll see a group of jubilant souls sitting around a jug of “Turbo,” a perennial favorite among locals who want their booze cheap and potent. It begins with one of the staff bringing out a plastic jug, into which he pours a bottle of local white wine (typically the Awash brand), a large bottle of local Bedele Special beer (look for the spider monkey on the front), and a bottle of Sprite. After that, things get lively quickly, hence the nomenclature. The local cocktail is a popular example of the Ethiopian culinary practice of spris, the Amharic word for “mix.” Although it certainly applies to cocktails (another favorite combo is red wine and Coca-Cola), the concept of spris extends far beyond the bar. Order a spris in an Ethiopian café, and you’ll get a cup half-filled with tea, half-filled with coffee. Asking for a spris in a juice shop results in a glass colorfully layered with the freshly squeezed contents of whatever three fruits that happen to be in season (for example, mango, papaya, and avocado). The spris phenomenon also applies to food: Ethiopia’s staple of injera is basically a platform for anything and everything, ranging from spaghetti Bolognese to scrambled eggs to cubes of raw meat, all accompanied by never-ending options of spices and sauces. Some bars might swap in different brands (7Up for the Sprite or St. George for the Bedele), but as long as it's a white wine, beer, and lemon-lime soda mashup, it's a Turbo. Best to ask locals for directions to this sweaty and riotous (once the dancing starts) underground bar at the epicenter of the city’s old Piazza center in all its in-your-face reckless and somewhat seedy glory. Utah's favorite nonalcoholic beer got its start more than a century ago as a German brew.